No not the rapper, even though she's not high on my list of people I do like lol. I've been taking the depo shot for the last three or four years because when I have cramps of any kind they can almost incapacitate me. If I don't get the pain killers in soon enough my day will be shot to high heaven and today I mistimed the whole thing. My mother is working on that last good nerve because she has to do things a certain way and when she can't she just whines and whines until I'm ready throw her outside, lock the door and go back to bed. I got some work done for other job but days like this I'm cranky and not functional so chatting with people is a bad idea. I did talk to my brother and that was good. Made me miss him and we swapped crazy mommy stories. I had to account for his share because she hasn't gone to visit in quite some time much to my chagrin. From home shopping networks to random other craziness I had plenty of doozies to share with him. I want to wash my hair but my head hurts so much right now I'm worried about passing out in the shower but I may give in and do it since today is the appointed wash day. Plus I am interested in seeing how the three combs work on my hair after four days of extra curls. Maybe I'll eat some ice cream and hope the sugar rush calms my system down. I'll be back later and finish this. Okay I'm back. I did go ahead and co wash my hair and I'm glad. Even though there was less hair loss than the last big wash out from a flexirod set, there was still more than I would like it to be. So I've opted to skip the flexi set tonight and have tied down my edges to see if I can accomplish a mostly straight airdry. I can always pin it up in the morning if I need to, bobby pins are the greatest things I swear. This will help me do a few other things with my hair as well. Until the next wash I can moisturize and seal without damaging the style and I can tend to my edges a bit more. They actually look fine and are thicker than they used to be but the hairline isn't as long as all of the hair around it so it needs more attention. 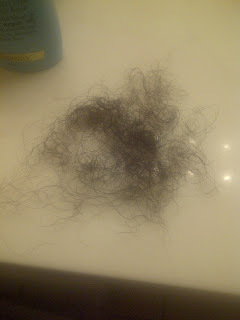 Including photos from the last major detangles which were were about a week apart. So yes LOTS less hair loss but still more than there probably should be most of the time. Sorry it's blurry cause I took it with my camera phone instead of my camera. And after reading a page on KISS I may need to up my iron intake. I'm usually anemic which makes no sense to me as I take multivitamins and hair vitamins. But I have been several times before as I don't consistently eat red meat or green leafy veggies. Even today when I wasn't feeling great I had a piece of chicken and a ham sandwich. I want food I don't usually crave beef though. Oh well. Just placed my order with the nice cub scout who came by to sell us popcorn who triggered my mother's favorite story of me as a brownie and my EXTREME reluctance to sell cookies to our neighbors. Yeah for forced kiddie sales lol. Okay enough babbling for the day. Trying not to be annoyed by the hair on my neck now that it's hanging down lol. Trying not to be annoyed by the hair on my neck now that it's hanging down lol.We want length so we tolerate it. Yeah I definitely want the length. The strange thing is there's a point on my shoulders that doesn't bother me and the point right AFTER where my hanging now doesn't bother me. But something about this one location makes me itch lol. Oh well the things we do for long full beautiful hair.